Confidently understand what your horse is thinking, why they do what they do and how to communicate successfully with them. Develop a connection that will bring you both closer together and have you understanding each other so that together you can reach your goals. Renew your relationship with your horse and develop a true partnership. Learn how to work with your horse safely and easily on the ground and to ride with confidence at all gaits. All tuition, meals, camping and horse board included. • Pay a deposit from July 1st to October 30th (unless sold out beforehand) and receive 20% off. Balance due before March 1st 2019. • Pay a deposit from Oct 31st to Dec 31st (unless sold out beforehand) and receive 10% off. Balance due before March 1st 2019. • All payments after Jan 1st will be at the full camp price. MULTIPLE CAMP DISCOUNT, FAMILY DISCOUNT AND DISCOUNTS FOR INTERNATIONAL STUDENTS AVAILABLE. LEASE HORSES ALSO AVAILABLE. Create a connection with your horse based on understanding and trust. Explore the depths of your relationship with your horse, and build a connection and understanding with them that will take your horsemanship to a whole new level. Learn how to read your horse intimately, connect with him or her and communicate in such a way that will create a strong bond based on mutual trust and respect and lead to a willing partnership. We’ll look at all elements of handling and riding beginning with how we approach and catch our horse, how we connect with them and work with them on the ground. We will improve our on-line and liberty work and learn how we can achieve more by doing and asking less. We’ll then progress to how we ride, how much rapport we build or lose in the saddle and also how we can make contact riding more pleasurable for our horse. This is a very exciting subject that is interesting, intriguing and absolutely invaluable. Taking an in-depth look at horse / human relationships, what horses truly want and bringing out the best in your partnership with your horse. A real eye opener. Prerequisites; Riding participants must be Level 1 graduates or higher. Study the confidence and connection level with the master of building both, Shane Ransley. Nothing creates confidence in riders more than creating a truly confident horse and no one does that better than Shane. Knowing how to bring out your horse's true personality, sense of fun and play and begin self carriage and collection is a real skill and one that will bring you and your horse even closer together. Imagine giving your horse the gift of enjoying their time with you as much as you do with them! A true connection through working on longer lines and at liberty, emotional fitness for both horse and rider at all gaits and even in open spaces, will give you and you horse the freedom to go where ever you want, do whatever you want, when ever you want. Level Two is extraordinary and more than any other event, this camp will change your life and your horse's too. And spending 9 days exploring this with Shane is something that you do not want to miss. Do it for yourself, do it for your horse.....do it for your partnership, but JUST DO IT! Level Two Camp with Shane Ransley during The Quantum Savvy Experience 2019. Harmony in Motion - horse and human coming together in perfect unison. Learn how to move with and influence your horse with the subtlest of communications and become a balanced, graceful partner for your horse. Also developing the beginnings of natural flexion and collection. Have you even watched someone ride and admired the beauty and perfect synchronicity between horse and rider? 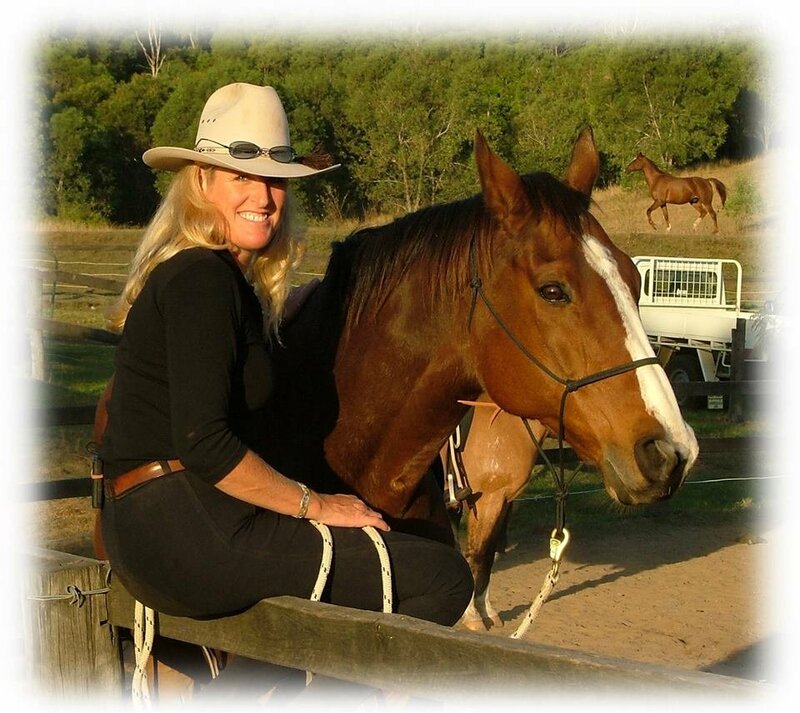 A Harmony in Motion camp with Meredith Ransley will teach you how to become as one with your horse. Harmony in Motion is about learning to move and ride with your horse in flowing and graceful movement. Develop softness and harmony on the ground like perfect dance partners and learn how to move in time and unison with your horse when you ride. Harmony in motion looks at the different shapes and movements of humans and horses and teaches people how to smooth off their 'pointy' bits and move with more clarity and smoothness on the ground and in the saddle. You will become a lighter more sensitive rider - easier for your horse to carry - and your horse will develop more lift and self carriage. Prerequisites; Minimum Level 1 graduate. Ideally Level 2 graduates or higher.